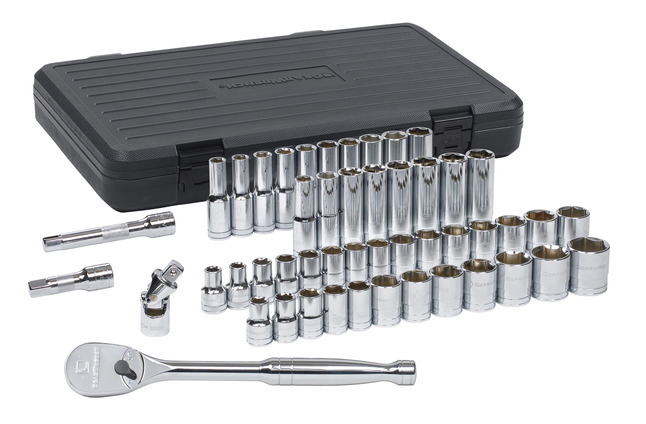 Gearwrench 1/2 in Drive SAE/Metric Socket Set comprises of 49 pieces of 6-point sockets that include an universal joint, thumbwheel ratchet, full polish teardrop ratchet, 3 in and 5 in standard extension, 10 standard SAE sockets, 13 standard metric sockets, 10 deep SAE sockets and 13 deep metric sockets all packaged in a blow mold case. The standard SAE sockets are sized 7/16 in, 1/2 in, 9/16 in, 5/8 in, 11/16 in, 3/4 in, 13/16 in, 7/8 in, 15/16 in, 1 in, 1-1/16 in and 1-1/8 in. The standard metric sockets sizes include 10 mm, 11 mm, 12 mm, 13 mm, 14 mm, 15 mm, 16 mm, 17 mm, 18 mm, 19 mm, 20 mm, 21 mm, 22 mm, 23 mm and 24 mm. The deep SAE sockets are sized 1/2 in, 9/16 in, 5/8 in, 11/16 in, 3/4 in, 13/16 in, 7/8 in and 15/16 in. The deep metric sockets sizes include 10 mm, 11 mm, 12 mm, 13 mm, 14 mm, 15 mm, 16 mm, 17 mm, 18 mm and 19 mm.